DCI workers upholster furniture for state agencies and private citizens. Whether you possess a heirloom that needs a complimentary look or a favorite chair or a settee that needs repair, DCI can handle it. 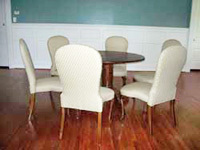 "These are the beautiful chairs you refinished for us. Thank you!" "I just wanted to let you know how happy my sister and my mother are with the furniture that was refinished at your facility. The dining room set was my mom's and she gave it to my sister when my mother moved out of her house. The pieces are approximately 60 years old, and it was a pleasant surprise to see them refurbished to like new condition. The work was completed to a level that exceeded their expectations. I too was quite pleased with the results of the work accomplished through Prison Industries. I was not however surprised, since I had toured the facility and seen first hand the professional quality results. I was however impressed with the polite, helpful, and professional demeanor displayed by everyone at the facility. I should have complimented you and your staff when I delivered the furniture, since I experienced the same level of treatment from the staff at that time. Please share our complete gratitude to everyone involved." "I want to tell you how delighted I was when I saw the sofa David picked up yesterday! The workmanship is truly remarkable and those who helped in the restoration of my sofa can truly feel proud of their expertise! I know I will enjoy this beautiful piece of furniture for many years to come. Thank you for your dedication to this project and my sincere gratitude to all who helped restore my family heirloom!"